A shark snatched from the San Antonio Aquarium and wheeled out in a baby stroller is back in its petting tank, and investigators say they've obtained confessions from two men involved in the deed. 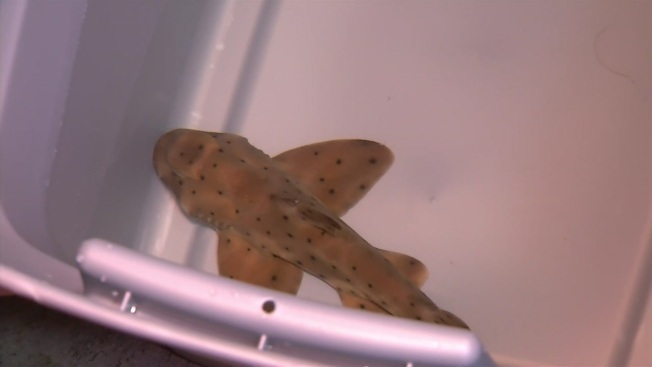 Surveillance video had shown two men and a woman carrying a baby sneaking the 2-to-3-foot-long gray horn shark from the aquarium in a stroller Saturday afternoon. They got away in a pickup truck, which police tracked down Monday evening. Police Chief Joseph Salvaggio in the San Antonio suburb of Leon Valley says the men confessed to the shark snatching, and investigators planned to talk with the woman on Tuesday. He says their home has so many marine animals inside that it almost seemed like a mock-up of the San Antonio Aquarium. The aquarium said the thieves brought their own net, NBC News reported.